Voices above the majority crowd to read with your ears! This week’s free audiobooks from SYNC speak in voices from beyond and within America’s bordersso you can read with your ears! As the Riveras travel to the USA so daughter Maribel has a better life, voices from Latin America tell their tales meet them during their exodus and in their new land. In the early 1970s reporter Daniel Ellsberg tracks down secrets about the USA’s involvement in the Vietnam War, risking his own life and liberty to disclose government disinformation to the American public. How can listening to stories beyond the mainstream help you understand more? 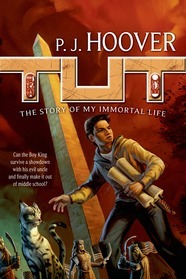 Tut: The Story of My Immortal Life, by PJ Hoover (book review) – pharoah in junior high? Ruling as powerful pharaoh – yay! Stuck in middle school for eternity – ughhh! And Tut’s forever-13-life becomes more complicated as a cult dedicated to evil god Set targets monuments in Washington DC, the general who killed his father is after him, and a mortal classmate gets involved in the hunt! Be sure to check out the book trailer here and the author’s website where you can visit the novel’s world in Minecraft, play games, and solve puzzles. Would you let a friend join you in a dangerous quest? Book info: Tut: The Story of My Immortal Life / PJ Hoover. Starscape, 2014. [author site] [publisher site] [book trailer] Review copy and cover image courtesy of the publisher. My book talk: Immortal teen Tut suddenly has bigger problems than an overprotective guardian and middle school bullies as the man who killed his father centuries ago reappears as head of an evil-worship cult in present-day DC. Rescued by the god Osiris from assassination, now Tut lives with a golden scarab heart, forever age 13. Centuries later, his middle school’s field trip turns ugly when “Tut’s Tomb” exhibit includes dark god Set, much hated by the real Tut. Scarabs swarming everywhere, exploding obelisk monuments, and too much attention from kids at school – many eerie things are happening in Washington DC. When the general who killed Tut’s father escapes from his eternal prison to lead Set’s followers in destruction, Tut and mortal friend Henry follow clues found by his army of tiny shabti soldiers and advisor Horus in cat form. Can they save DC residents from this supernatural peril? Why is Tut’s guardian hiding a deadly secret? Will Tut have to use the last spell in The Book of the Dead to stop Horemheb?